While I have plenty of rabbits, squirrels, and deer in my back yard in Silver Spring, over in Herndon they have foxes! And speaking of things with red hair, here's my nephew making his YouTube debut with a movement from a Boccherini Cello Concerto. And here he is playing it with his school orchestra. We have a little fox who visits us in Burtonsville. I'm glad he likes cat food better than cats AS food! Heck, you figure it out. bozoette - I think I saw a picture of your little fox that you posted a while back. He was cute! If you are still feeding him, you'd better not leave any shoes outside. I heard they like to steal shoes. I see them every now and then in Bowie. One made her den underneath a shed in a backyard in a nearby neighborhood - a good mile away from any woods. Mike - It's fun to see them, but I hope they don't get too bold in their suburban meanderings. I never see them on the Hill, but I'm waiting. We have a fox who casually saunters through our yard (well inside the Beltway) on a regular basis. We also have a coyote. Your nephew is really good. There must be a lot of music genes in your family. Kristin - I would be really surprised if a fox ever showed up on Capitol Hill, but I did see an opossum at 3rd and D, SW one time last year, so I guess you never know. Barbara - Wow, an actual coyote! That's a little scary. 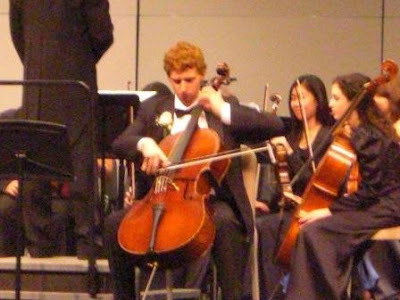 My nephew has done very well on the cello thanks to hard work, an excellent instructor, and talent. Interestingly he is thinking about majoring in classics, ie Latin, when he goes to college next year. I like that I live in DC but can see wildlife so easily. I get a lot of racoons in my yard along with birds and squirels but no foxes. I know nothing about classical music but your nephew sounds good to me. He seems very comfortable with himself and the instrument. At least thats how he comes across. A man here in Bowie was attacked by a rabid fox two weeks ago. You can read the story here. A local resident also wrote about a recent incident where he had six foxes in his front year during a recent night.